The WMIHPU15 series of Class II medical AC/DC wall mount power supplies offers up to 15 watts of output power in a 2.36” x 1.71” x 1.58” package. This series consists of single output models ranging from 3VDC to 55VDC with an 80~275VAC input voltage range and a -10°C to +70°C operating temperature. This series meets FCC Part-18 Class B and CISPR-11 EN55011 Class B Emission Limits and has ANSI/AAMI ES 60601-1: 2005 (UL/cUL 3rd edition) and CE safety approvals. All units are RoHS and Energy Star Level V compliant. 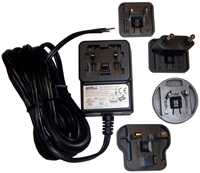 Plugs come in United States (“U” suffix), Europe (“E” suffix), Australia (“A” suffix), and United Kingdom (“K” suffix) types. Plugs are sold separately so please contact factory for ordering details. 2. Output can provide up to peak load when power supply starts up. Continuous staying in more than rated load is not allowed. 3. At factory, in 60% rated load condition, each output is checked to be within voltage accuracy. 5. Load regulation is defined by changing ±40% of measured output load from 60% rated load. 6. Ripple & noise is measured by using 20MHz limited bandwidth and with 0.47F capacitor in parallel across the output at nominal line and rated load. 7. Hold-up time is measured from the end of the last charging pulse to the time which the main output drops down to low limit of main output at rated load and nominal line. 8. 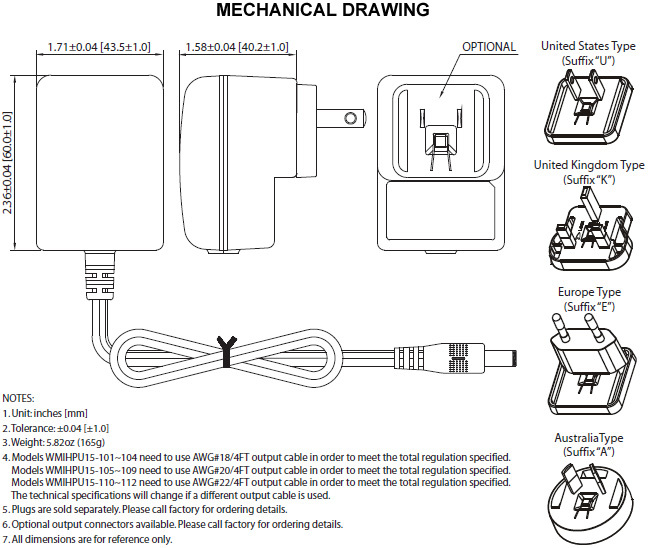 Optional output connectors are available for this series. Please call factory for ordering details.